Snagged a very decent Andrea TVK-12 and expect to be picking it up in a few days. The chassis looks like a DuMont (or DuMont inspired) model, such as an RA103. It appears to have the Mallory Inductuner. Anybody know much about these sets, any tips or comments about these models? I'll be doing the usual complete recapping and component checks and going from there. If there's any thing in particular I oughta look out for I'll appreciate the heads up! Haven't dug into a tv in a few months now so I'm getting' a little itchy for some new fun! Wow, cool project. Good for you. Similar to a Dumont RA-103, but maybe incorporating Andrea circuitry also? The two pioneering companies probably "shared" design info to produce their respective products. Whatever the connection, both companies produced excellent receivers, IMO. Happy that you found one in such nice condition!! Best wishes for a rewarding restoration! That's super nice and it looks all original. I don't know how you feel but I would rather work on a unit that has never been serviced underneath the chassis. It makes it super easer using SAMS. I've wondered why a 6AL7 eye wasn't incorporated in this set? That's exactly how I feel about really original sets that haven't been serviced sub chassis. It says there much less chance for weird stuff caused my Mickey-mousing, and that the set may very well have no serious issues, or others would have done work under there to correct it. Defnitly a high quality set though and nearly as heavy as a DuMont!! I think this one was probably getting a weak CRT and the owners decided it was time for a new TV rather than buy a new CRT. Nice find. Those were high-quality sets. I had found a near mint original fresh from an estate years ago and so regret selling it. Good luck with your resto. That'll be a great player once restored. 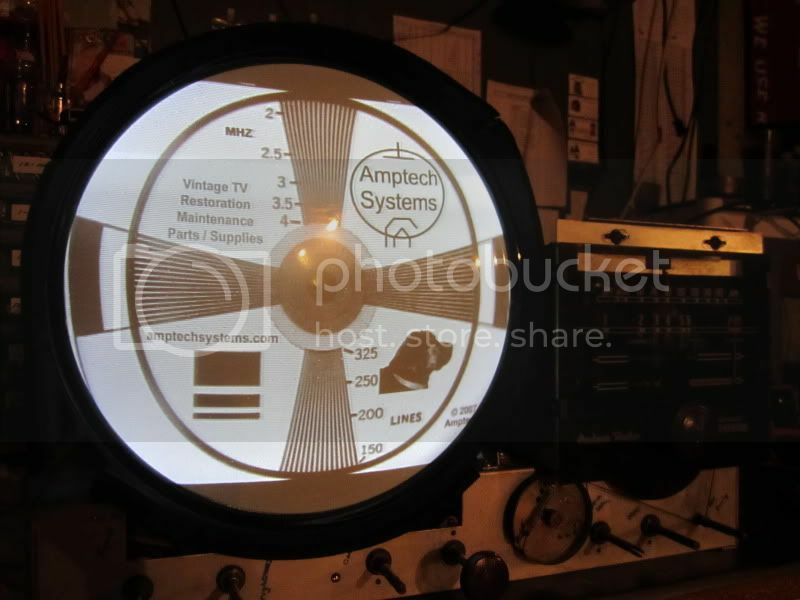 Outside of the Mallory InducTuner, I really don't see a connection to the DuMont. Anybody else want to illuminate me? Here's mine. I like this set. A lot. Between these two, I hope to make one good one. Oh come on. You should try to make two good ones! I haven't had a chance to look any closer at the chassis. The inclusion of the AM tuner on the main chassis is different from DuMont, but visually chassis looks darned similar to my RA103 Chatham. As I dig into it I'll likely find lots of differences thiugh. Perhaps I could. The red one has a lot of delaminating and veneer damage on the cabinet, but if I have two good chassis/CRTs, yet two working sets, but also only one set of knobs. 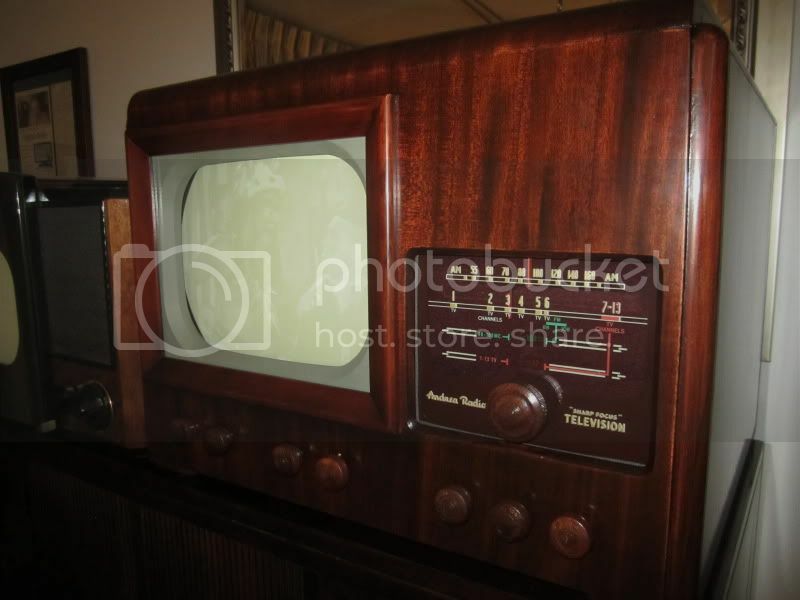 I do like these sets with AM/FM radios built-into the TV chassis. The GE 901, Stromberg Carlson TS-125 and Garod 10TZ4 are excellent examples too. Lee, thanks for the link to your restoration. I'm sure its an inspiration for George as well as myself. You did a real sweet job on that set. Thanks for sharing the post. I think my cabinet is in better shape than yours was when you started but I may use your techniququd with the 600 paper and Howards. I'll keep everyone posted as I go along. If the finish is better than mine, start with 1000 grit and go to 3000 using Howards. Watch the edges! You can go through the vineer quite easily. Rub straight with the grain. Take it slow and easy. Good thoughts. Will start at 1000 In an inconspicuous spot. And yes I've learned about veneers and their vulnerabilities the hard way! !